Gold nanoparticles have many properties that make them exciting objects of study in cancer research. For example, they are nontoxic, can carry a variety of therapeutic and diagnostic agents, and are small enough to reach targets in the body that other delivery systems can’t. 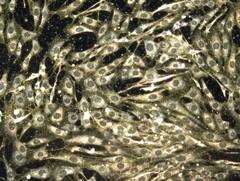 This dark-field image shows the delivery of gold nanoparticles (yellow dots) into the cytosol of cells.